You know you’re deep – really deep – into summer when plump ears of local sweet corn and dead ripe tomatoes start to monopolize the real estate in your local markets. We’ve arrived there, my friend, and it’s time to seize the moment and broaden our horizons with a corn pie you and yours won’t soon forget. 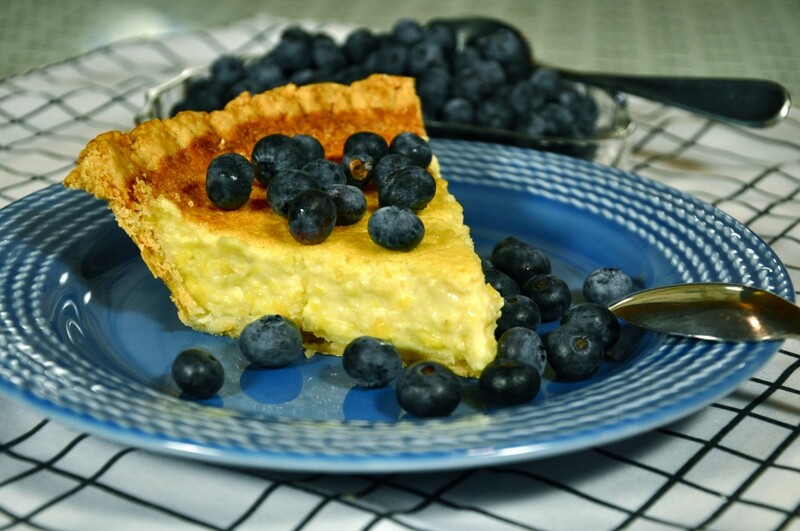 I give you…the drumroll please…Sweet Corn Custard Pie. And it’s a dessert pie. Corn? you wonder: don’t we typically use corn in savory dishes, not sweet? Indeed, and that’s what makes this pie so memorable, so irresistible. It’s our chance to turn expectations on their head, and throw a little curve ball at our pie loving family and friends. It’s summer, by golly – why not? A word of caution, if your custard pie making skills are a little rusty: simple and accommodating as they are, the one thing custards can’t tolerate is extreme heat. Bake them too hot, and the eggs will break, leaving you with – essentially – sweet, watery scrambled eggs. So go low and slow: you can’t do any harm to this pie if you err on the side of moderate heat. Enjoy these last days of summer. See you back here soon. PASTRY NOTE: I recommend either the FOOD PROCESSOR PIE DOUGH or the GOOD BASIC PIE DOUGH for this pie. If your corn is fresh and tender, you can probably get away without cooking it at all; simply cut the corn off the cob with a sharp knife. If the kernels are large and perhaps a little less tender, it would probably be a good idea to boil the kernels for 2 minutes, to tenderize them just a bit. Put about half of the corn in a blender with the light cream and sugar. Process briefly, until the corn is chopped up without turning it into a puree. Set aside. In a large bowl, gently whisk the heavy cream, vanilla, salt, nutmeg, and egg yolks just until evenly blended. Stir in the blenderized corn mixture and remaining whole kernels. In a clean, dry mixing bowl, beat the 2 egg whites until they hold soft peaks. Add them to the custard, then fold/gently whisk them in. Don't overdo it; stop as soon as they're incorporated but the mixture is still frothy. Ladle the filling into the partially prebaked pie shell. Place the pie on the center oven rack. Bake for 30 minutes, then reduce the heat to 325°. When you reduce the heat, turn the pie 180 degrees, so the part that faced the back of your oven now faces forward. Bake another 20 to 30 minutes, until the filling is set. To check, give the pie a little nudge: the filling should jiggle, not move in waves. The top of the pie will probably turn a nice golden color. Transfer the pie to a cooling rack and cool thoroughly. Without covering, put the pie in the fridge and chill for at least 6 hours or overnight before serving. For storage beyond that, cover with tented foil (so the foil doesn't touch the top of the pie.) Makes 8 to 10 servings.